The new 100 litre capacity Low Profile Diesel transfer unit added to the Selecta Dieselpak range provides the ideal means of conveniently transferring a diesel fuel supply around a property or job site or to an engine, pump, tractor or equipment out in the field. With its low profile design and dimensions of 800 mm in length, by 620 mm in width and a height of only 440 mm the 100 litre capacity tank will fit easily on the tray of a utility or small vehicle. The tank is manufactured in the impact resistant Polytuff and is supplied complete with a reliable 12 volt powered diesel pump. The easily recognised distinctive grey coloured tank also signifies that it is for use with diesel fuel only. The tank profile is moulded to allow the delivery house to coil around the tank with the gun mounting at the front of the tank. It also includes a padlocking facility for added security during transport or when not in use. Accessories supplied with the tank include a four metre length of cable complete with battery clips for attachment to the vehicles own or a remote battery power source. The 19mm diameter hose supplied has an auto shut off gun and a swivel adapter so that it can be used to fill hard to reach engines or filling points. The diesel pump will deliver an open flow rate of up to 40 litres per minute. A suction foot filter protects the pump from damage while the all up weight of the tank when empty is only 18kgs. The Selecta Low Profile Diesel tank of 100 litres capacity is the latest addition to a range of eleven different tanks all with a 12 volt (or in larger tank sizes a 24 volt) diesel pump, delivery hose and cable accessories with fill capacities ranging from 100 up to 2,200 litres of diesel fuel. 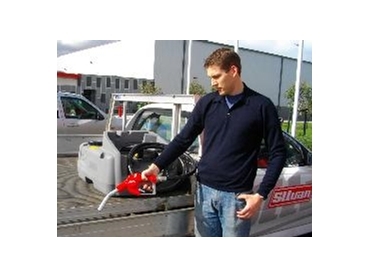 The new 100 litre capacity Low Profile Diesel transfer unit is available from Silvan Australia .